"Great for Xmas Brunch, or anytime adults would like a tasty champagne punch! You can substitute your favorite fruit juice for orange juice." In a pitcher, mix juice and champagne together just before serving. It's a mimosa. Nothing special or unique about this recipe. 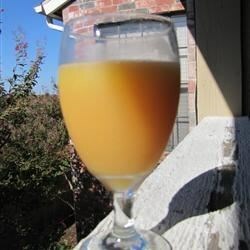 I have frequently made Mimosas by the glass, but it is a real time saver to know how to make a large batch. The preportions on this recipe are great. The absolute best use ever for cheap champagne!! A true brunch necessity. It's Christmas brunch tradition to have these, but then I saw this recipe the otherday, and though, it's a good spring tradition too :) Very yummy. Served this yesterday at a ladies luncheon. They all raved about it. Just the right proportions of juice to Champagne, Sue. Thanks!